Howdy - first time poster and potential BMW owner. I am helping out some family with getting a 2008 K1200S back up and running. I am curious on your thoughts... should I get it running and sell, or get it running and keep. 1. Bike is a 2008 K1200S with just over 7k miles on it. 2. Bike does not appear to have ever been down, but has a few scratches etc on the plastics. 3. Bike has not been ridden since approx 2014. Has been in a climate controlled home since. 4. Bike had all engine oil, brakes, clutch fluids drained out (missing bleeders). I am not sure on the hypoid oil or coolant. 5. Bike does not have any service history with it. Just title and a manual on CD. I have a few other bikes and would love to keep this, but I'm a bit concerned on the many recalls it may be part of and abs issues I am seeing so far. I can do all the work myself (did a complete teardown and restoration on my Magna and do valves, timing belts, etc on the Duc). What are your thoughts and what would be a fair price for this bike to pay my Aunt? 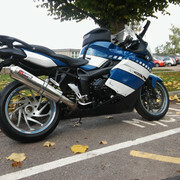 Welcome to the site Rob, when you get a moment introduce yourself here, http://www.i-bmw.com/forumdisplay.php?f=152. As to the bike, you didn't mention price, but that is an important consideration on a 10 YO bike that's been sitting for 4 years. These bikes do better when they're used as intended, seals and seams tend to dry out otherwise which can spur leaks. As to the ABS, fortunately your proposed bike post dates the ill-fated servo ABS equipped bikes, so the ABS unit on that bike can be rebuilt professionally, and there is at least one great thread in the 12S tech forum on how to do it yourself. As for the rest, I'd start by having a dealer run the VIN as you can then determine the dealer service record, if any, and the status of any recalls. If it were me I'd probably hold out for a later year K1300S as they were better sorted than the 12 S models, but then cost becomes an issue. Do look at the 12S tech forum for threads on commonly occurring issues and let us know what you decide! First try and get as much service history as you can. Call a local dealer and have them run the V.I.N. they will be able to tell you something. The 2008 was a good model year many of the earlier problems had been sorted by then. Draining the brakes I'm not so sure that was a smart move - seals may be all dried out and need replacing. 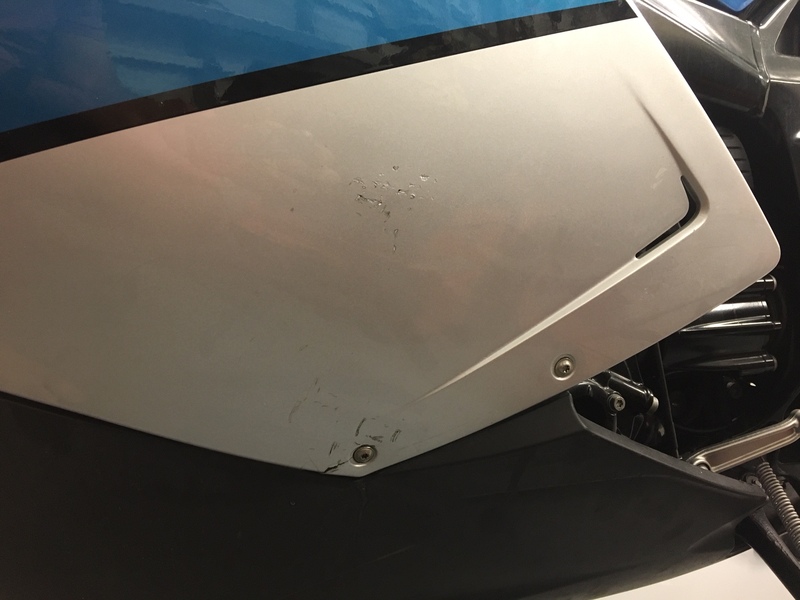 The good thing is you stated the bike has been in a climate controlled storage area. A fair price is hard to say - since you really don't know what you have until you get it back to road worthy. Start with letting your aunt tell you what she wants for the bike. I would not want to give a lot for the bike not knowing what I was getting into. Honestly $2K-$3K is all I would be willing to gamble and even then if you have a little bad luck - you may wish you didn't buy it in the first place. A better approach may be to tell your aunt you will do the work required to bring it back to life and then you can decide if it is something you want or sell it for your aunt and take your expenses from the sale and give her the remaining funds. I can't imagine why in the world anyone would drain the brake and clutch fluid, other than perhaps some very misguided idea that they were helping to preserve something. In reality of course it's more likely the opposite. But it's not certain any harm has been done, you'll need to get the bike on the road to find out. In order to fill the brake system in its current state you'll need a tool such as a GS911 to activate the ABS brake bleed procedure (this wouldn't be necessary if the brake system was filled, in which case you could just replace the fluid by normal bleeding at the calipers and be done, but oh well), or pay a dealer to do it. Note that the clutch reservoir requires mineral oil, not brake fluid. If the final drive was drained, no big deal, just fill it per the proper procedure. Hopefully they didn't drain the cooling system as that requires a vacuum fill tool to refill properly. Otherwise, as noted above a 2008 model should be past most of the early slant-K teething issues and, if after getting the bike on the road you experience no problems, could be a great bike, and only 7k miles on it to boot. I'd definitely get it running in order to sell because a running, low-mileage bile with no problems will command a much higher price than a bike full of unknowns. Thanks all so far... looks like more homework to do, as well as grabbing a GS911 diagnostic tool. The bike's worth next to nothing unless it's running. As a parts bike it would be hard and time consuming to make any money off it. Another approach is to get the dealer to give you a price for checking it over and a price for replacing the fluids, battery, and getting it running. Then see if your aunt is willing to pay to have that work done. If it is up and running and the dealer doesn't see anything majorly wrong with it, then like Bruce said it is probably worth about $2500. Could run 5 to 10 k miles or maybe 100k; hard to say. It's true that K-bikes are not in the highest demand but $2500 is way low for that bike, just look at NADA, Cycle Trader, Craigslist, etc. I'm not going to get into a debate over this because anyone can say 'you won't get that' and maybe be right or maybe be wrong, but even allowing for asking vs. selling prices you should be able to do at least double that in a private sale for a 2008 K1200S with only 7k miles that is in good condition and road-ready. Thanks all... here is a bit of an update, though not really had any time to tinker due to the holidays and repainting the garage floor. Also need to put new timing belts on the Duc which is likely going to take priority. 1. Need all the vent screws (bleeders) as I was not able to locate them. Going to order from bike bandit etc. 2. Will order all new fluids... oil, filter, German spec coolant, mineral oil for clutch, and dot 4 for brakes. Will also replace the rear diff oil while I'm at it. 3. Need to order a vacuum tool for the coolant. Looks like maybe $60 will suffice and then pretty simple to bleed the air out of the system. 4. Tires are from 2013... Michelin but will replace them once I am roadworthy as no sense in running old rubber. 5. The left side panel / fairing has enough damage that I will replace it with an eBay one in better shape. There is a crack near a mounting hole as well as some damage about the size of a fist. 6. I ran the vin on an online recall list. It lists three... fuel tank flange, rear wheel flange, and front brake bubbles. There is already a sponge in the front brake reservoir, so assume at least that was done. There was no mention of anything related to timing chains, abs, or the fuel gauge / fuel tape. Based on this, I feel I can get the bike up and running for about $1000 including tires and the GS911 scan tool. I'm then thinking the bike would be a nice specimen 2008. In that running condition, it would seem to range in price from $4500-6500 from what I am seeing. Sound about right? Sounds like a good plan. Keep us posted as you make progress. Regarding the faring, they can be pricy. 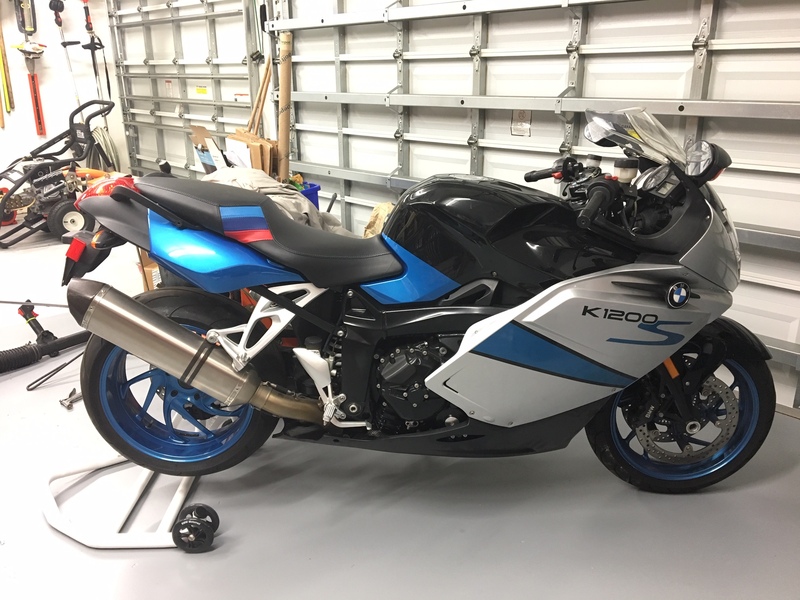 I had my local body shop prep and paint some panels on a k bike and it was relatively inexpensive. Just a thought. Good luck. PS buy Speed Bleeders to make the brake bleeding process easier. Looks like a nice bike with a nice exhaust /seat /screen upgrade . 1. Pulled the calipers and replaced the brake pads. Found the rear pads were de laminated from the backing. 2. Sourced new brake bleeders and flushed and bled the full system. Luckily have the newer abs pump so wasn’t as bad. 3. Sourced new bleeder for the clutch and bled using the specific oil. 4. Found one of the engine balance adjusters was partially pulled out... had to drop the pan to get it back in. Also had to pull half the exhaust to do so. Does the stock header include 5-6 separate pieces, or do I have a full aftermarket system? 5. Changed oil and filter. 6. Found an oil leak on the cylinder head cover by the cam chain. Pulled the cover, cleaned, and got it back on. What a PITA. 7. Filled the coolant system with the vacuum method. Pretty easy. 8. Replaced some missing bolts here and there... water pump, engine cases, etc. 9. Removed a broken engine bolt from the clutch side cover. Had to helicoil the hole but all set. 10. Pulled the fuel tank and drained the old varnish. Installed the metal ring onto the fuel quick disconnect mount as well as metal quick disconnects. Bye bye plastic. Best of all, got the bike started and up/down the street. Sounds great and seems that most everything is coming along. I did end up making a deal with my aunt and got the title this week. Thanks for the help! Glad about the progress. The list didn't come across. Did you replace both male and female quick disconnects? Reason I ask is, I’ve read that many have some issues with the metal disconnect screwing into the plastic tank leaking? Something about the threads are a little different???? Where did you purchase the replacements ones from? Nice job on the revival. I couldn't read the list on my phone but now on the computer and see you've done quite a bit. Good work. You'll have loads of fun for sure. I did the same thing with the disconnects on my 1999 Ducati... plastic, fuel, and age just don’t mix. The female portion threaded into the tank just fine, but I did add some black plastic bonded as well as the female part of the tank where it goes was starting to get some stress cracks. Mcwideglide: As for tires... you are correct. The bike has some Michelin’s on it that are from 2013. After I get the title transferred and a plate/insurance, I will be taking it to the dealer for a few open recalls. Will try and have them put some new rubber on as I don’t like old tires either. Just not worth the risk. Many great tires out there. Can't go wrong with Pilot Road 4s or Power RSs depending on your riding style. 2. Had to replace the front disks... one of them was warped by over 0.020” (0.5mm). Spec per manual is 0.15mm. 3. Found a few more loose and missing bolts... replaced them and ensured the remainder were tightened to spec. 4. Got title transferred over, plate, and insurance going. 5. Ordered new tires today... Battlax T30 EVO. Will install this coming weekend. 6. Need to make a date with the dealer for a few recalls to be done, namely the rear wheel flange. Otherwise all running great... did 40 miles today and it ran great. Too much power for my needs... running smooth and not a stumble at all. Thanks all for the help and suggestions. Good to hear. Now the trip planning begins. Agreed on trip planning. 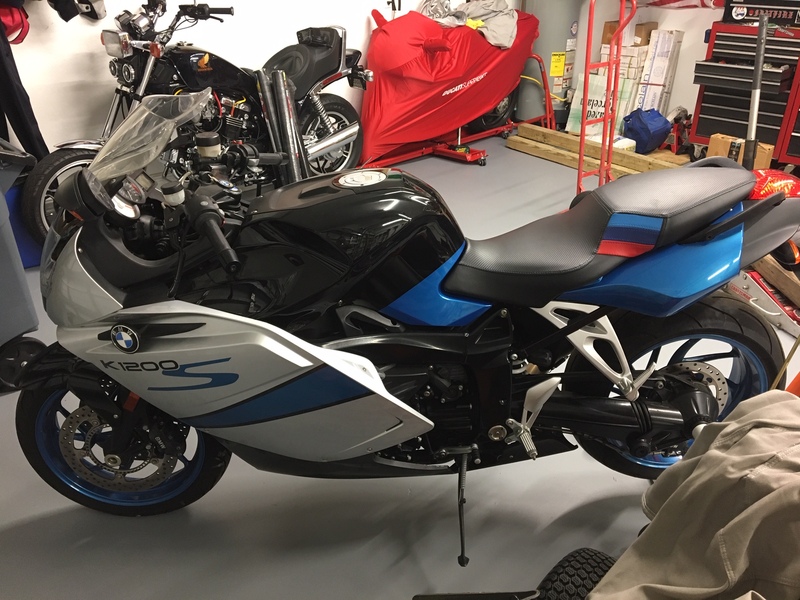 Put on new tires this weekend (Bridgestone battlax T30] and changes put the rear diff fluid with 180ml of new BMW gear oil. Waiting on the dealer to get parts for the four open recalls... something with rear wheel flange, chain guide (assuming cam chain), front brake (assume sponge for front reservoir) and fuel tank (assume something with the sealing ring). 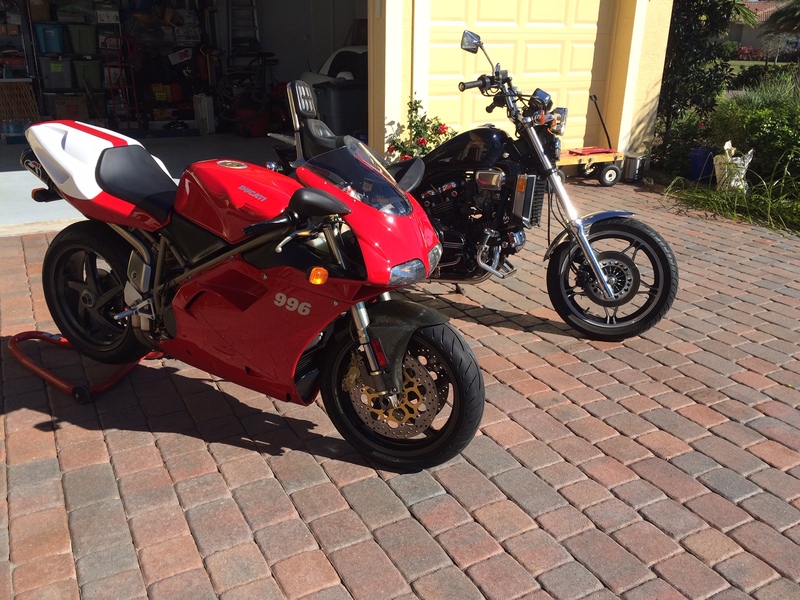 Otherwise enjoying it and glad to have the new ride in my stable along with an 83 V65 Magna and 99 Ducati 996s. Craig, I believe the servos were discontinued on the K12's on Aug 2006 (my infamous K12R is a Jun 2006). So, a 2008 has the upgraded ABS with no servo. BTW, you have my exact same (and year) K12S. Look at what I did on the color scheme! Very nice. The black additions to the faring look great. Black is, after all, the best color. Mate, usually (at least in my case) was not due to the gasket being bad. If it keeps leaking even after the gasket change, it's because the the lower chain guide is pushing against the valve cover. The reason is that if this bike (as it MUST) has installed the timing chain jump guard, the guard pushes the lower chain guide up by something like 3-5mm. So, I shaved that part off the jump guard. I believe I shared everything when I did that work. Let us know if the leaking stopped, if it didn't, I can guide you in how to fix it. But do installed the jump guard. That's a free recall by BMW regardless of year. Also, they should replace the rear wheel brake disk carrier/hub. It came in aluminum and very prone to cracking if over-torqued. Also, the fuel pump has a recall to replace or install a collar to avoid the pump outlet from cracking. One of the replacement finds on the fuel pump flange is if it is cracked, replace the unit. The other thing is they had a ring gauge to slip over, if it slipped on and no cracks a ring was place on the flange. It is holding perfectly so will be interesting to see what they say. I wasn't going to fork out a few hundred dollars on a new or used fuel pump assembly to get a non-cracked version. I have a feeling you wouldn't say that about Vantablack, the true black. A great looking K bike. Will be interesting if BMW will still do the fuel pump flange replacement for free, they should. I never knew something like that existed. Very interesting. Kind of like a black hole - not even light can escape. That was another way to do it. it aggravates me that BMW did such a poor and sloppy job on this fine machine. I have extra chain guides when these ones went. But, in the end I ended up buying two engines with allegedly low miles (under 7K miles) for each K12. Regarding the pump, I have like three extra with the cracked outlet. But, the one on my K12R cracked and started leaking. Put an adjustable clamp on it, and it's been there since 2014. No leaks. Do check on your rear wheel flange and try the dealer for the fuel pump replacement. What's that Ducati you have in the back? ...........Waiting on the dealer to get parts for the four open recalls... something with rear wheel flange, chain guide (assuming cam chain), front brake (assume sponge for front reservoir) and fuel tank (assume something with the sealing ring). Interesting. I had my cam chain guide taken care of in '11 at about $370 out of pocket costs. I'd written a strong letter to them after reading about the assembly grenading and taking out entire engines. After four or five months they agreed to pay half. Sounds like I got screwed OR the recall was the result of lot bitching. Aside from that, I'm impressed with all that you've done! Your K bike is beautiful and I hope you get lots of enjoyment from your rides. Also, post more pics of your 996 in the other bikes forum for the other Duc owners here (that would be me). Also, post more pics of your 996 in the other bikes forum for the other Duc owners here (that would be me).